This week on Wine Wednesday Alicia and I were joined by Jim Mirowski, the co-founder of Treasure Island Winery, for a tasting and to discuss San Francisco’s surprising winemaking roots. 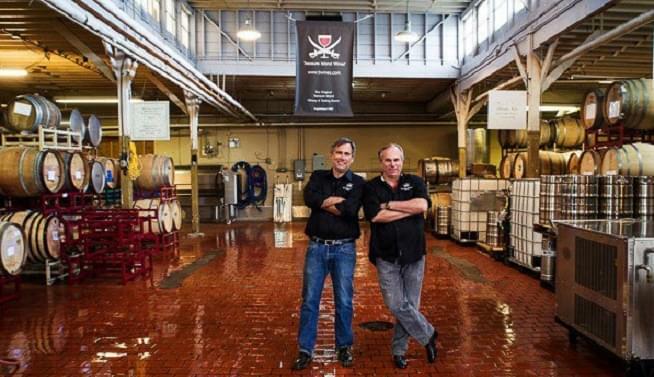 Treasure Island Winery was the first winery and tasting room on the former U.S. naval base. Now, the industry has caught on to the fact that it has the ideal cool climate for making wine. While Jim pours Alicia and me a glass of the 2016 Chardonnay, Carole Martinson discusses the Kohler & Frohling label, which, before prohibition, was America’s most well-known winery headquartered in 626 Montgomery, the current address of the Transamerica building. Now, Treasure Island Winery is working in partnership with Kohler & Frohling to resurrect the historic brand. Listen for more on where winemaking has been and where it’s going in San Francisco, and definitely check out Treasure Island Winery in their gorgeous tasting room in the Bay. Wine Wednesday is presented by Alaska Airlines, where Wine Flies Free for Mileage Plan™ members.